Photographer, Software Developer and technology addict! 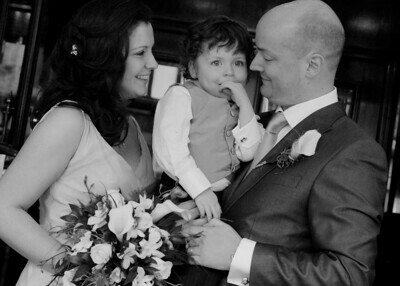 That’s me in the shot opposite with my wife and son at our wedding. By day, I work as Product Director for a successful international software company. Photography is a passion that has developed over the past few years. It’s a very rewarding creative outlet. I get a huge amount of satisfaction from people’s reactions to my photography – whether it’s casual moments with family or an important event like a Wedding. My attention to detail and my love of candid photography make weddings an ideal event for me. They also make me a creative and unobtrusive photographer. As a photographer, it’s an event rich in opportunity – the emotion, the moments, the outfits, the details, the list goes on… You also share most of the happy couple’s special day so it’s hard not to get caught up in all the emotion - even with people you barely know! For all the reasons above, weddings are a hugely rewarding day for me both as a photographer and a person. We're lucky to live near the wonderful Chester Zoo and our family membership means we can visit often. I take lots of shots of the animals there and work hard to make them look like they aren't taken at a zoo! You can also buy a selection of images HERE with a contribution to the charities behind these venues.